The Callahan Laboratory at Boise State University is a 525 square feet research laboratory in the Science Building (Room 412). The lab contains multiple lab benches and two fume hoods to conduct experimental work. Supporting equipment include: an ultrapure lab water system (Milli-Q IQ 7000), analytical balances, pH and ion meter, vortex mixer, centrifuge, vacuum centrifuges, chemical derivatization setup, high temperature furnace, and refrigerator/freezer. Our Thermo Scientific Exactive Plus mass spectrometer is an Orbitrap-based mass analyzer capable of ultrahigh resolution (140,000 at m/z 200), very high mass accuracy (<1 ppm mass error), and “all ion fragmentation” using the HCD cell for structural characterization. This instrument can be easily coupled to our HPLC for high resolution accurate mass (HR/AM) LC-MS for high-throughput screening, compound identification, and quantitative analysis. Acquisition of this instrument was made possible through the NASA Laboratory Analysis of Returned Samples (LARS) program, grant number NNX17AE51G. Our Thermo Scientific Accela LC provides fast, efficient chromatographic separations over a wide range of flow rates (up to 5 mL/min.) and pressures (up to 600 bar) for HPLC and UHPLC. A Thermo Scientific Accela Photodiode Array Detector (PDA) provides full wavelength spectra and highly sensitive detection of analytes. Instrumentation in the Department of Chemistry and Biochemistry at Boise State that we frequently use. Bruker AVANCE III 600 MHz NMR Spectrometer (left photo) and Bruker IPSO 300 MHz NMR Spectrometer (right photo) are located in the Chemistry Department NMR Facility. These instruments are used at no cost and students can be trained to use both NMR spectrometers by the NMR facility manager, Prof. Joe Dumais. Thermo Scientific Trace GC Ultra gas chromatograph coupled to an ITQ 900 mass spectrometer and equipped with a TriPlus autosampler in Science Building, Room 354. Perkin Elmer Spectrum 100 Fourier Transform Infrared Spectrometer with universal attenuated total reflectance (ATR) accessory is located in Science Building, Room 350. This instrument can acquire IR spectra for both liquid and solid samples quickly and easily. Bruker HCTultra ETD II Mass Spectrometer is equipped with an electrospray source and is located in the Science Building, Room 359. Samples can be introduced by direct infusion using a syringe pump or by HPLC. 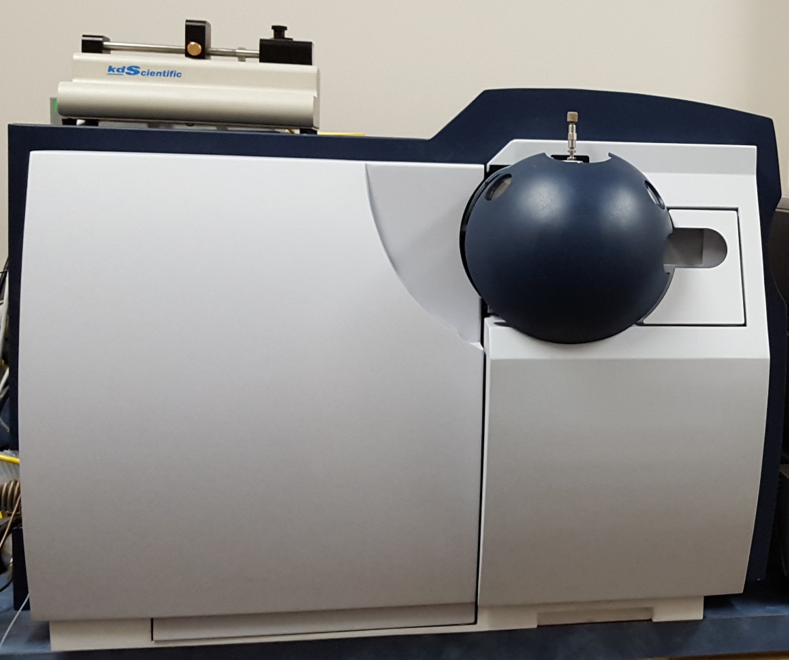 An Agilent 1100 High Performance Liquid Chromatograph with Diode Array Detector (UV) and Fluorescence Detector sits next to the ion trap mass spectrometer.